Google Recently updated their Chrome browser version to 8 with lot of bugs fixed but the chrome application store got missed out,Google promising that Chrome web store will be available to Chrome web browser as soon as possible. Google already informing developers about the new changes to chrome.You can also enable application section from new chrome tab page by installing the web applications. Step 1 : Make sure your Chrome web browser is closed properly. 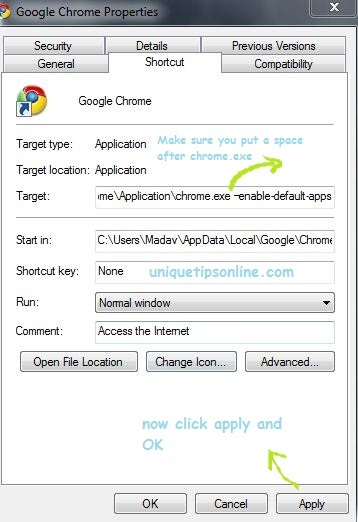 Ste p2 :Select Chrome Properties and append following text to target area: –enable-default-app and click ok to finish. Step 3 :Now Type chrome://extensions/ in your address bar and click on devoleper mode and then click on update extensions now button. Now you will get a page same as below in your tab page in chrome browser. If you are on Mac and linux operating system please open terminal and run below code before you go through the final step.open /Applications/Google\ Chrome.app –args -enable-default-apps.Linux users can use following code /opt/google/chrome/google-chrome -enable-default-apps. If you got stuck some where in enabling Google Chrome web store application section please don’t hesitate to contact me.